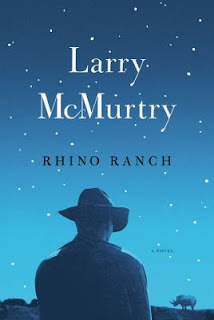 Rhino Ranch by Larry McMurtry appears to be the final installment in his series of novels set in the fictional town of Thalia, Texas. OK - the story so far. In The Last Picture Show (written in 1966) we meet Duane Moore, Jacy Farrow and Sonny Crawford, lovesick teenagers who come of age in a dusty one stop light town (Thalia, Texas). Duane and Sonny fight over the beautiful and selfish Jacy, permanently injuring Sonny. Duane enlists in the army and all face an uncertain future. We meet them again, 30 years later, in Texasville. Duane, now an oilman who is deeply in debt is married to Karla and they have a number of unruly children. Jacy returns to town after a mildly successful acting career and Sonny is tired and dispirited. And now poor Duane's Depressed. He disturbs the residents of Thalia by abandoning his truck and taking up walking as his mode of transportation. His psychiatrist prescibes Proust in lieu of Prozac. When the Light Goes finds Duane returning from a trip to Egypt, recovering from Karla's death, and finding himself at loose ends in Thalia. On the home front his son Dickie is running the company and his daughters are irritating him. Duane unexpectedly finds himself romantically involved with young Annie Cameron. So, deep breath. In this latest (and presumabley final installment) Duane's marriage to Annie crumbles and he returns to Thalia and his beloved grandson Willy. Local billionairess K.K. Slater has opened a ranch (employing old friends Bobby Lee and Boyd) to rescue and breed black rhinos. One old rhino, named Double Aught, takes a liking to Duane and joins him on his walks. As Duane approaches the end of his life he witnesses the passing of old friends, but in true Duane Moore style, continues to forge new friendships whether with women, cowboys or rhinos. McMurtry offers an unromanticized view of small town life in modern day Texas. Locals do not accept change or new people very easily. New businesses are regarded with suspicion as are residents who depart and return. Thalia is as much a character in these novels as Duane or Bobby Lee. Sometimes you are left with the impression that not alot has happened, but the characters are so vividly drawn that they will come to mind again and again. Fans of Larry McMurtry's contemporary fiction might also enjoy Cormac McCarthy. His Border Trilogy also begins in Texas in the 1950's and features adolescents struggling with their rural environments. John Irving, though different in terms of setting, does offer up eccentric characters,which are reminiscent of McMurtry's, and puts them in sometimes tragic situations which can still somehow seem humourous. McMurtry's Thalia books bring to mind John Updike's Rabbit Angstrom novels. Here, again, we can follow Rabbit Angstron from his youth to his final decline. His books, like McMurtry's were written over decades with the authors aging along with their characters.